Project: Mars is the more generic name for a podcast concept that I came up with which is loosely modeled on This American Life. Essentially, what I would like to do is explore the every day life of the lower to middle class person living in a city on Mars. To do this successfully, I feel as though I need to start with a realistic setting. For that reason, I plan on modeling out an entire martian city of 2.9 million people. The city was originally a colony designed to house about 10,000 settlers, but over time had grown beyond the capacity of its original colony plan. What compromises did the settlers make to allow for added population? How do you plan cities on Mars? What are the civil engineering challenges? These are all questions that I hope to find answers to as I explore the topic. Of course, none of this has started yet… what you see here is a very humble beginning… and I decided to start with this image of Mars at sunset. What I imagine a sunset on Mars to look like from orbit. Sorry about the lens flare. It’s been a while since I create an image exclusively in the GIMP. There’s something satisfying about taking a bunch of 2D tools on a 2D canvas and ending up with something 3D. The image to the left extensively uses the Plasma Cloud render filter, Lens Distortion Filter, some creative use of layer modes (additive, multiply, screen, etc), and of course the Lens Flare. This entry was posted in Project: Mars and tagged announce, mars on July 14, 2011 by Richard. I’ve started to put some thought into where the martian city is to be located. To do that, I need to study a little bit on martian martian topology. It turns out that we have some raw data from the Mars Orbiter Laser Altimeter. Yeah, I know it’s really not raw data… who knows what the MOLA instrumentation spits out, but it’s raw for me. This image is some kind of ridge. There’s clearly a drop off in altitude into smoother, less cratered terrain. This image reminds me a lot of the moon. It’s pretty amazing that the martian atmosphere really doesn’t protect it much from the pocking of meteorite impacts… or at the very least it doesn’t cover it up over time like here on Earth. This looks like some kind of insane canyon system. It starts out pretty solid on the right side of the image, but turns into a complex spiderweb of cracks and crevices as it moves to the left. Having the actual raw data will enable me to create cool height maps in Blender. Looking forward to creating little flight videos through there. I bet it’ll be just like Beggar’s Canyon back home! This entry was posted in Project: Mars and tagged data, mars on July 19, 2011 by Richard. I started toying with converting some of the mars bitmaps into height maps. Here is my first render… This is that crazy canyon formation (called the Valles Marineris) that I mentioned in the previous post… and I believe that’s Olympus Mons in the distance. This entry was posted in Project: Mars and tagged 3d, blender, mars on July 21, 2011 by Richard. It was clear to me from the inception of Project: Mars that I’d need to do a lot of research. In order to get down into the nitty gritty of what I want to write/record/produce, I need to come up with a mythology for the world I’m about to create; ostensibly the world we as a race will create in about 150 to 200 years. My goal with reading this is to understand the problems of current space flight so that I can come up with a plausible history. Whatever humble beginnings lead to colonization of Mars will dramatically affect the culture there. At about 50 pages into the book, I’m very impressed with the technical details and frank opinions expressed by the author, Robert Zubrin. While I get that there are far more complex issues involved with manned space flight than I’ll ever fully understand… I think that this book will provide me with what I need to spin a story about early mars habitation and the pioneers who dared to have the right stuff to do it. When I’m done, I’ll have a full review of the book over at I Smell Sheep at some point. Look out for it! This entry was posted in Project: Mars and tagged book, mars, space, zubrin on August 4, 2011 by Richard. 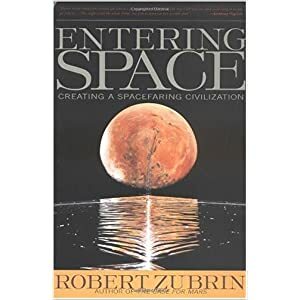 About 3 weeks ago, I wrote a post about Robert Zubrin‘s book Entering Space. My full review (although admittedly kinda terse) went up today on the I Smell Sheep review blog. It was a pretty good read… and added a lot of insight into what the history/mythology of the Project: Mars setting. Even though, this book was written *AFTER* the book I’m currently reading… I am glad that I picked up the books in the order that I did. 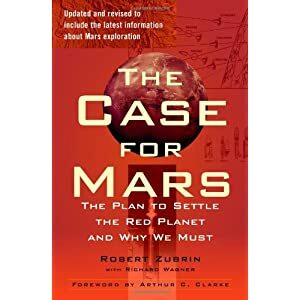 A Case for Mars is a far more in depth (not to mention thicker) book than Entering Space and it concentrates heavily on the early settlement of the Red Planet. One of the most interesting bits that I hadn’t considered as far as my podcast concept goes… is, Mars is likely to be over 100 years into a terraforming process. In a LOT of science fiction, we constantly hear about terraforming being a process that takes centuries. According to this book, a huge chunk of the process of converting Mars into something habitable by Earth life could take place in as little as 50 years. By the time of the podcast, Mars’s atmosphere will be about the same as Earth’s as far as temperature and pressure go; though still unbreathable to humans. (We’ll have to walk around with breathing aparati). That’s pretty amazing… No need for pressure suits… that’s HUGE. This entry was posted in Project: Mars and tagged book, mars, zubrin on August 25, 2011 by Richard.